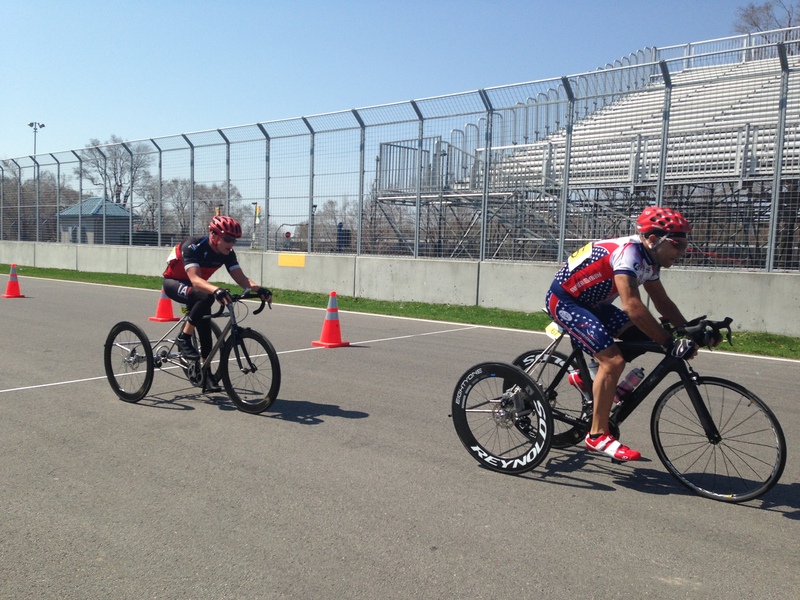 The para-cycling World Cup #3 in Switzerland has come to an end. Congratulations to all the athletes, especially Team USA for a job well done. Results here. For some, the Parapan American Games in Toronto and the World Cup #4 in South Africa are up next. For me, it’s a wrap, folks. My 2015 racing season is now over. It has been a bittersweet ride thus far. I did very well for my first full season of racing. Now ranked 4th in the country and having done better than expected, I was asked to go to the next and final World Cup of the season in South Africa in September. I put a lot of thought into going, but it is with a heavy heart that I have to pull the plug on my 2015 race season and focus on next year. At the conclusion of my series of races in May, I suffered a bit of a hamstring injury that sidelined me for a few weeks. During this time, my mother, who for the past 13 months battled stage IV lung cancer passed away. I have to say, it was a privilege to care for my mother during her time of need, as she spent her entire life devoted to helping me through the physical challenges I have had. Looking back on my season, I am extremely pleased and proud of what I have accomplished considering my time was split between training and being primary caregiver. Needless to say, it was exhausting. Now that life is back to normal so to speak, I am 100% focused on furthering my success towards the Paralympic games. Once again, thank you to everyone who had a hand in getting me this far in such a short period of time. Without your help, this would just be a dream. Going forward, your support will set me up for a successful 2016 season. Donate here. 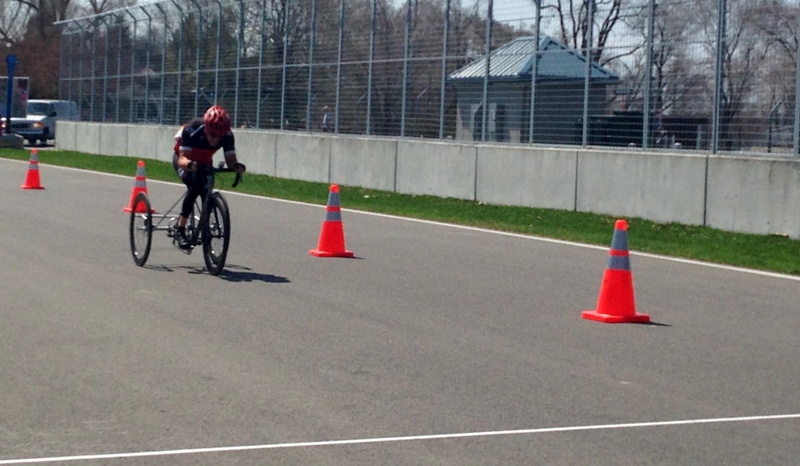 On May 3rd, I pulled off the best performance of my young racing career at Défi Sportif in Montreal. My goal going into this event was to show improvement over last year’s performance at Nationals in Madison, Wisconsin. I also wanted to show that I had the ability to stay close to the person who was nationally ranked in 3rd place. 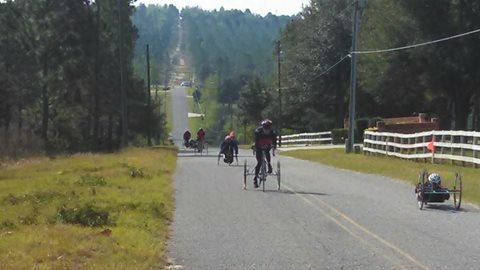 This road race was organized in such a way that I raced with mixed classes of hand cycles and trikes and, at the end, everyone was separated by class to determine the winners in each. Two waves of hand cycles started, each one minute apart, prior to the trikes. 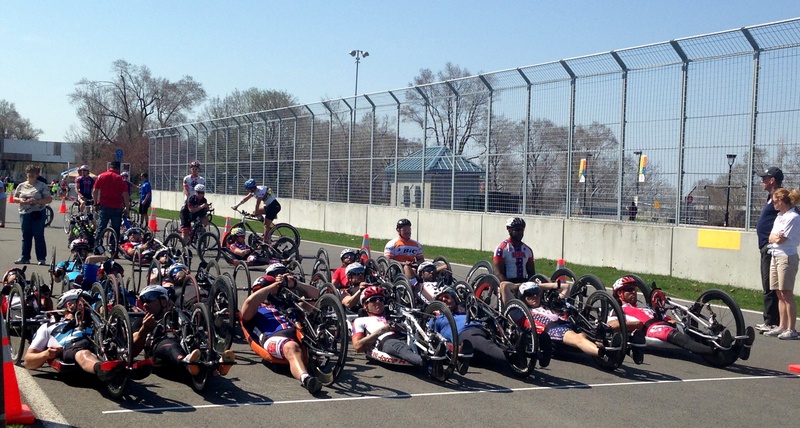 In all, we were ten trikes, but fifty racers on the track, including all of the hand cycles. As you can imagine, this makes it exciting to watch but challenging for the participants. We were all fighting for the right position or line to take on the course that would give us an edge over the other. 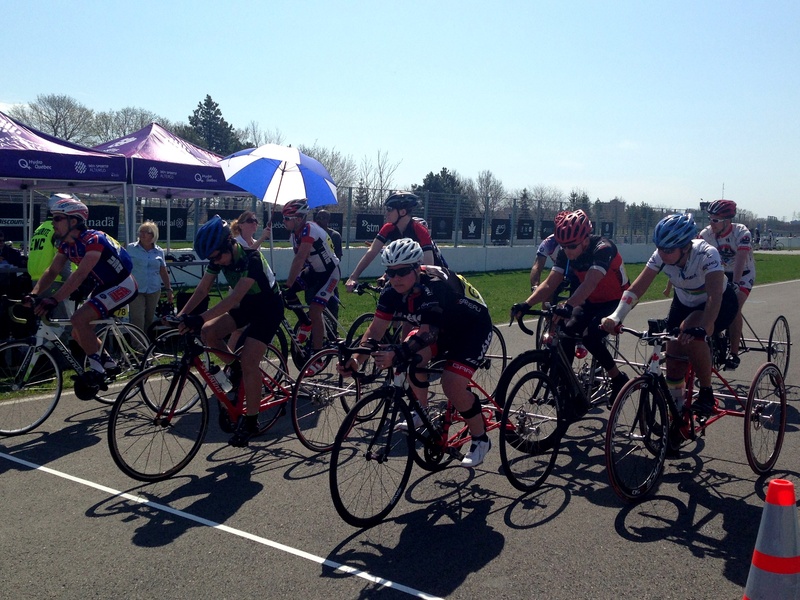 At the end of the first straight away, I found myself in last position. I was stuck behind a rider who, for some reason, was weaving from side to side making it very difficult, and possibly dangerous, to pass at speed. By the time I was able to pass, the main field of trike racers were gone from sight. As I finished my first lap of five, I could hear my coach screaming at me to catch up to Frank (Matzke) and for us to work together to close the gap on the main field. I had no idea how far ahead Frank was (or, in this case, how far behind I was), but I gave it my all. After two laps, I caught him, and as I pulled up next to him, pretty spent at that point, I said, “Man, you are a hard S.O.B. to catch!” Then I asked if Rick had shouted at him too. He said yes and we quickly agreed to work together to close the gap. For the next two laps, we took turns pulling each other around the course – drafting off each other to reduce the workload of going that speed and improve our overall time. Frank pulled first, which allowed me to recover from trying to catch him – thank you Frank! What was really cool for me, was that during these two laps where we pulled each other around the course, it was the first time I got to use the skills and techniques that I had learned during the training camps – specifically pace lines (including trading positions in the line) and drafting. Towards the end of the fourth lap, I began to think about the race to the finish – where Frank might make a move to create space for the final sprint and where or how I might make mine. I was in the final pulling position – in front – and, when I looked back, and I didn’t see Frank in my draft. He was off to my right side, still behind me, but outside of the draft. I thought he was making his move to start sprinting. So I went as well. Digging deep for the final push to the finish! We were probably 300+ meters away from the finish line. It was a LONG sprint. Of course, Nathalie was there screaming on the sidelines for both of us. I dug deep. And, on this day, I was the better rider by two seconds – taking fourth place in our class. Afterwards, Frank just said, “Good sprint!” My appreciation of his sportsmanship multiplied, but, more importantly, we agreed to work together going forward to improve our times and chances at podium finishes. Thank you Frank for a race I will never forget! Lately, people have commented that I must be training hard because they rarely see me anymore. Yes, I am training hard and I take it very seriously. I consider it my job. I have a full schedule of six days a week with oftentimes two workouts a day. The first of the two workouts is anywhere between two and three hours long and I end my day with the recovery session. I’m not going to get into the specifics of each workout, as they change from week to week. In addition to cycling, my workouts include weight training, swimming, core stabilization, balance training and stretching. This is what it is like to be a professional athlete and it’s what’s required to train for the Paralympic games. It’s a demanding schedule and if you add the time it takes to manage life with a disability like Cerebral Palsy, you can quickly realize there’s little time for anything else. Now that the dust has settled, I wanted to sincerely thank everyone who had a hand in making my paella fundraiser such a HUGE success. Paella master Bill Conklin and Richard Sellman donated their time and whipped up an amazing feast for those in attendance. Good times! After all, this is Sonoma County and, if you live here, you know you can’t have an event without food and wine. In other words, my foodie friends would disown me if good chow wasn’t part of the deal. And this paella was more than just ‘good’ – it was AMAZING. Family Wineries of Dry Creek generously donated the space for the event. Normally, having an outdoor event in late February can prove to be a bit dicey when it comes to rain, but Mother Nature cooperated and provided near-perfect weather – lots of sunshine with only a few gusts of wind in the early morning hours, making set up the only difficulty. Hey, nothing but a few rocks and a staple gun can handle, right? Thank you Shaun! In all seriousness, your kindness and generosity continue to amaze me. Like most athletes, Paralympic hopefuls or otherwise, corporate backing is extremely rare. As a result, I can only go as far as you take me. Without community involvement and support, my efforts to make Team USA would simply not be possible. It truly does take a team of people to make this happen and what an incredible team I have. To my wife Nathalie, Ramona, Bridgette, and John, I can’t say it enough – thank you for being there for me and my family. I promised it would be an adventurous ride, no doubt with a few surprises along the way. Not all support is financial, yet it is just as important. For me, it is often times priceless. That said, I’d like to thank Dave Townsend at Santa Rosa Physical Therapy for providing the professional bike fit included in the silent auction as well as keeping me rolling with my unique set of physical challenges (more about that in an upcoming blog). 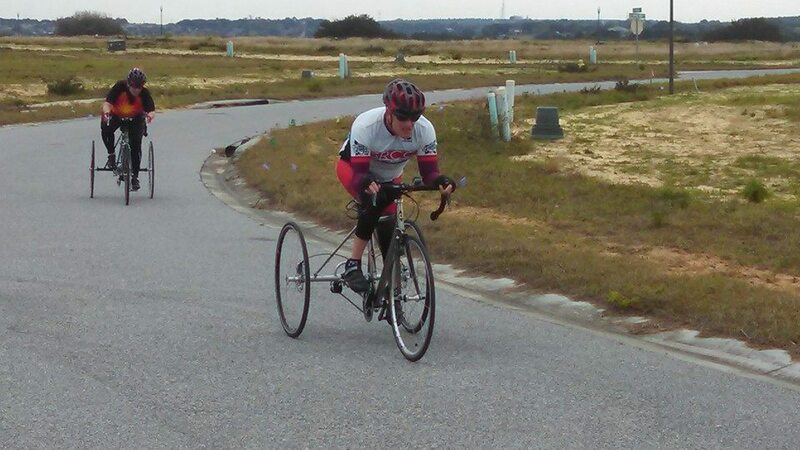 It was an honor to have been selected to attend the U.S. Paralympics Cycling Talent Development Camp in Clermont, FL February 1-7, 2015. In addition to training with elite athletes, I made a number of key contacts. I had access to top notch coaching and gained a wealth of riding techniques to put in practice. Valuable information regarding equipment was also shared. Most importantly, I am in the US Paralympics pipeline and on their radar. I started the week off in bad shape. Prior to camp, I had a cold and it got worse due to the lengthy travel time and lack of sleep. No doubt I was feeling stressed due to the fact that I was new to the camp and did not know how things worked. As the week went on, my health improved, my stress was minimal and my performance rose to expected levels. Managing stress levels is key to performance. That’s why I feel it is so important to be a part of as many non-qualifying events as possible in order to work out kinks in a routine that can oftentimes be upset by travel and the unknown. Really, the best thing is to not have a routine. So when it’s time to perform at the highest level, the little things that go wrong are no longer a bother. Like I often say, it’s another day at the office and it’s time to get the job done. Do the best you can and enjoy every minute of the experience. Hill repeats on Sugarloaf Mountain, Florida. Closing the gap is a common phrase in my cycling circle. I seem to always be closing the gap between myself and another rider. So, I think it is appropriate to title my first blog “Closing the gap”, as I’m getting you up to speed on my present day efforts toward my quest to compete in the 2016 Paralympics. The difference today is I have surrounded myself with people who say it can be done and that I can do it. The difference is, now I believe it can be done as well. For me, it’s not about receiving a metal. It’s about being the best that I can possibly be every day. So, since 2011 (I’ll add another entry with more history soon), I’ve been slowly working every day towards my Paralympic dream. And I’m writing this blog to document the process, but also share this story. I hope, in some small way, it can help others with physical limitations strive to break out of their comfort zones too; to push their envelopes. I have a lot more to say. This is just the beginning. Thank you for joining me and I hope you’ll tell me your thoughts, ask me your questions, and share your stories with me along the way. More to come… SOON!! !